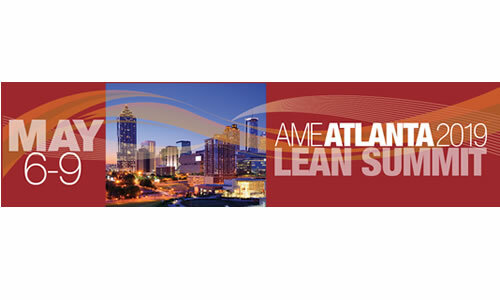 This year's theme of the AME Atlanta, 2019 LEAN SUMMIT is "Cultivating Tomorrow's Lean Leaders" The Atlanta Lean Summit will provide an opportunity to learn proven solutions that show how innovative, yet practical, thinking can transform complex processing challenges into sustainable solutions. The Southeastern region of the Association for Manufacturing Excellence (AME) is pleased to host their fourth Lean Summit in Atlanta. Whether you are serving in a leadership capacity or personally taking steps toward becoming one of tomorrow’s leaders, the Atlanta Lean Summit 2019 has something for you. Learn about people-centric leadership, sustaining a metrics-driven organization, inspiring excellence within teams, working through conflict, maximizing business performance and more. Join us. Take the lead. Come to Atlanta this spring. Once lucky attendee will win a free registration to the 2019 AME International Conference to be held in Chicago! Speaker Marc Braun joined the Cambridge family in April 2008 as Vice President of Operations, and served as Executive Vice President of Sales and Marketing and was promoted to President in January 2017. Braun will discuss: • How to engage every employee, every single day, in continuous improvement • How to utilize video sharing to accelerate improvements • How to create daily habits that support continuous improvement cultures • How to celebrate “small” in order to win “big” • How to pay it forward—why lean tours are strategic. Crystal Davis is CEO of The Lean Coach, Inc. Davis’ career spans over a number of business functions, industries and disciplines in manufacturing and supply chain: automotive, consumer-packaged goods (beverage) and life sciences. Her strengths are strategy deployment, consulting, training, facilitation, coaching and speaking. After leading several teams throughout her career, Davis launched The Lean Coach, Inc. a boutique Lean Six Sigma and leadership development consulting firm in 2009. Davis will discuss the three-step process of just-in-time coaching. The beauty of just-in-time coaching is learning to leverage real-time problems and develop others to learn to see deeper than what shows up as kaizen opportunities identified in value stream mapping, while overlooking smaller problems in daily operations. People Centric Leadership – How to build a people-centric culture in your organization Speaker: Cindy Hinds Learn the behaviors required to build a culture where every day, everyone is fulfilled by pursuing excellence and everybody flourishes. Discover the value and benefits of building a people-centric culture, the underlying thinking that is critical to driving people-centric behavior and the key leadership behaviors necessary to achieve it. Toyota Kata – Discover the power of the Improvement Kata and Coaching Kata in helping to transform your organization Speakers: Hank Czarnecki and Bill Kraus During this workshop, the 4-step Kata methodology (challenge, current condition, target condition, test) will be applied to Buzz Electronics, a discrete manufacturing company. Through slides, simulations and storyboards, the Improvement Kata and Coaching Kata will be utilized to demonstrate how transformations can take place within any organization. Creating metrics to drive performance – Learn how to create and sustain a metric-driven organization Speakers: Georgia Tech's Ade Shitta-Bey and Mike Stonecipher Learn how to translate business and manufacturing information in a way that improves decision making and guides the organization toward achieving its strategic objectives. Learn what to measure, what not to measure, and how to use those measurements to optimize operations and avoid pitfalls. Conflict is the root of all waste – Why continuous improvement doesn’t stick Speaker: Scott Gauvin Discover why continuous improvement doesn’t stick and how employee engagement drives a CI culture. Understand the relationships among organizational structures, activities, prevailing behaviors and attitudes (SABA) – a key to unlocking performance potential. Building a dream team to accelerate your team’s journey to perfection – Heartbeat leaders first Speakers Tom Barto and Joe Barto IV Learn how to build a dream team by applying the continuous improvement tool set to identify and eliminate the waste in your total cost of labor and improve workforce productivity. It all starts with heartbeat leaders. Lean champions – Maximize business performance through lean, six sigma, and team performance improvement Speakers: Danny Barto and Doug Smith Learn how the best teams—dream teams— seem to so naturally and seamlessly boost employee engagement to make more money year over year regardless of top-line revenue. Benchmark and learn how to align your organization, improve leader behaviors, improve team engagement and improve daily execution. Benefits There are countless new insight discoveries that set innovative thinking into motion that will likely result in saving your organization time and money. There is nothing like the sharing that a fellow practitioner can provide. Our attendees always tell us they benefit from learning about lean from peers who are passionate about how they achieved success. They will share with you the good, the bad and the ugly, and how they managed everything along the way. Pricing: AME member - $995 Non-member - $1,095 Discounts are per attendee and cannot be combined. Discounts will be applied to the corresponding full price, $995 AME member, $1,095 non-member. NOTE: Registration opens at 3 p.m. You're encouraged to arrive early for checkin and registration. By 5 p.m., be at the "Networking Reception" in the hotel with heavy hors d'oeuvres and refreshments served. Meet fellow attendees and talk business with sponsors and exhibitors! Don't be late!....and have a great AME Lean Summit experience.